Transition Zone + Hally's -double shot. Push yourself with heart-rating monitoring and team spirit. 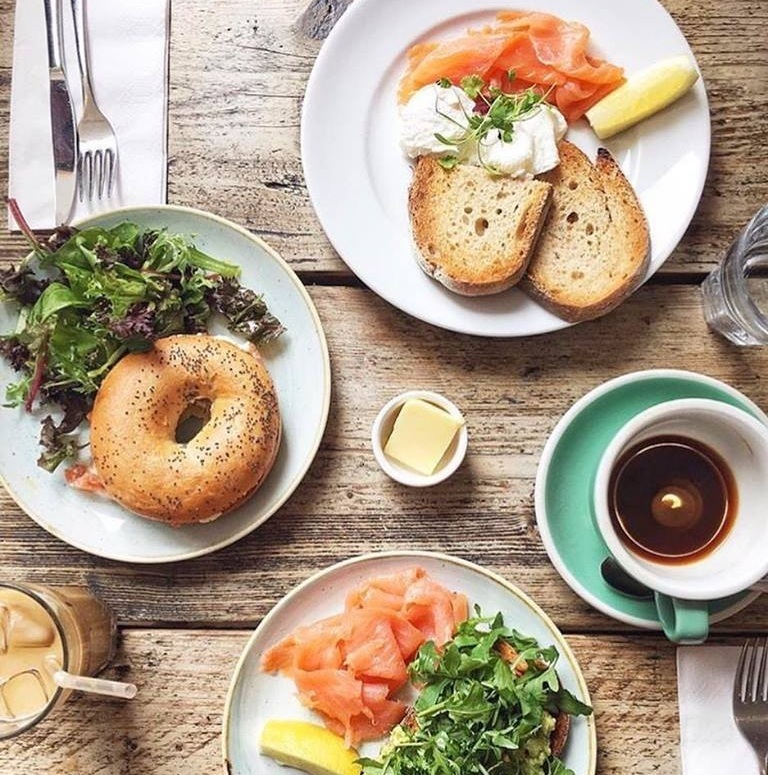 Then head for Fulham’s brunch queen Hally’s. START: Transition Zone, 17 Heathman's Rd, Fulham, SW6 4TJ, London. FINISH: Hally's, 60 New King's Rd, Fulham, SW6 4LS, London. THE WORKOUT: Saturday 9:55am Power Circuit (90% max heart-rate) with Luke or Katherine. Transition Zone specialises in small and personal classes and within their heart-rate monitored circuit template they offer three; Endurance, Speed and Power. Power is the most intense (your welcome). How hard you make the class is up to you. Move through the circuit using battle ropes, a squat rack, wall climbing ladder, pull up bar, jump boxes, kettlebells, SkiErg, Rower, TRX and a whole lot more for a full body workout. Power is all about working to 90% of your max heart rate and you keep track of it via a live screen that displays everyone’s individual heart-rate throughout class. Get yourself in the red zone at much as possible (90%) and go as hard as you can in your work period. Then spend your rest time recovering and move on to the next station. The variety of stations means that time flies and all you need to do is complete two circuits of all the stations before you’re done and stretching in the cool-down. At the end of the class you get emailed you’re results so you can keep track of how you did for next time. Make note of how fast you’re heart-rate can recover and over time you should see this decrease as you get fitter. This open plan gym fits the bill in terms of equipment, sweat-factor, community feeling, luxe facilities for showering and changing and motivating trainers. Transition Zone owner Claire is particularly awesome; a stickler on form, with masses of experience, a motherly mentality and a physique to die for. THE FOOD: Time to raise your heart-rate one more time (with excitement and anticipation at the menu obvs). Then its time to relax in the laid-back, Californian-style setting. Classics like “Eggs Benedict” and “Eggs Florentine” are no-brainers. They come with a rich, delicious homemade Hollandaise sauce oozing over perfectly poached eggs on crispy, toasted Sourdough. Choose to add smoked salmon if you like. Fair enough, these aren’t exactly dieter friendly menu choices, but you’ve just sweated your heart out so its time to enjoy yourself and order what you want! Butterflied sardines on toast with salsa- verde and watercress makes an interesting and fresh alternative to the standard salmon brunch-time usually offers. If you’re veggie, don’t worry. There are plenty of options catered to the power of plants. Of course Hally’s also does the wellness staple “Smashed avocado” on toast and pimps it up with ricotta, feta, mint and lemon. “Field mushrooms, gremolata and Sourdough” is also worth ordering; earthy, woody, salty, slimy, crunchy, this dish has all the textures and tastes going on - and it’s bloody delicious. Bigger appetites are also catered for with burgers, steak sandwiches and sizeable salad options available. Wolf your meal down with a coffee or juice. Coffee here is nice and bitter, with a range of nut milks (and regular milk) available. If you want to go big (it’s the weekend after all) then Hally’s also do wine and a cheeky Mimosa or Bloody Mary. If you still have room for something sweet, then head directly across the road to Little H - which is the baby sister of Hally’s. They display a range of baked goodies, smoothies and more take-away friendly options. FYI: This place gets packed, with the Parson’s Green yummy mummy crew, so you might have to wait. THE PRICE: A single class at Transition Zone is £20. First-timers pay £25 for two classes or £50 for ten days of unlimited classes. Hally’s brunch: Eggs Benedict £9, Smashed Avo toast £10.5, Caesar Salad £6.8 with extra chicken £3, Beef Burger £11, Steak Sandwich £10.5. BEST FOR: Embracing a classic Saturday morning work-out and brunch. Sophie Heywood 20 December 2018 Transition Zone, 17 Heathman's Rd, Fulham, SW6 4TJ, London.